A historic baptistery structure has been unearthed at one of the most important ancient sites in Kosovo by Turkish archaeologists. It is the first such excavation to be carried out by Turkish archaeologists in Europe. 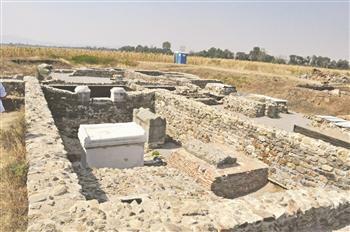 At an excavation site in Kosovo’s ancient city of Ulpiana, a team of Turkish archaeologists have discovered a baptistery dating from the Byzantine period. The archaeological team, consisting of archaeology students from Istanbul’s Mimar Sinan University and headed by Professor Haluk Çetinkaya, excavated in a 250 square-meter area, unearthing an important part of the sixth-century city. Mimar Sinan University graduate Elvis Shala, a native of Kosovo, also joined in the excavation, which lasted 70 days. Work at the site began on July 2, Çetinkaya said. “Baptisteries are rarely found in this region. We have succeeded in making a very important finding, as part of the first excavation Turkey has carried out abroad.